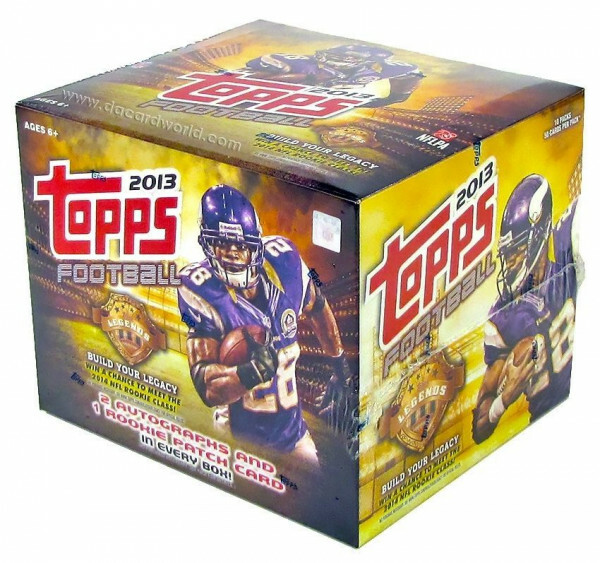 Factory Sealed 2013 Topps Football Jumbo Box mit 10 Packs a 50 Cards per Pack. 2 Autogramme und 1 Rookie Patch Relic Card per Box ! Produktinformationen "2013 Topps Football Jumbo Box NFL"
* 1965 Tall Boy Rookie HARD-SIGNED Autographs! * 1986 Topps Rookie HARD-SIGNED Autographs! * 1959 Topps Rookie HARD-SIGNED Autographs! 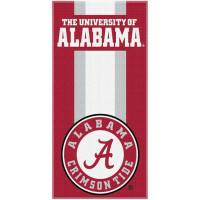 * NFLPA Rookie Premiere HARD-SIGNED VIP PASS Autographs! * NFLPA Rookie Premiere HARD-SIGNED Autographs! - Gold-Bordered Parallel Seq #'d to 2013. - BCA-Bordered Parallel Seq #'d to 399. - Military-Bordered Parallel Seq #'d to 399. - Platinum Foil Parallel Seq #'d 1/1. 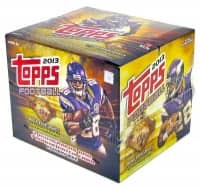 Weiterführende Links zu "2013 Topps Football Jumbo Box NFL"
Fanbewertungen für "2013 Topps Football Jumbo Box NFL"